Coattail investing refers to an investment strategy where an investor replicates the investment style of well-known successful investors. Individual investors use information published on the Securities Exchange Commission (SEC)The 1933 Securities ActThe 1933 Securities Act was the first federal law that was passed following the stock market crash of 1933. The law is also referred to as the Truth in Securities Act, Federal Securities Act or the 1933 Act. It was enacted on May 27, 1933 during the Great Depression. When signing the law, US President Franklin website to know the companies that a specific investor invested in during a given period. Coattail investing works well when the institution or investor being mimicked invests with a buy and holdStock Investment StrategiesStock investment strategies pertain to the different types of stock investing. These strategies are namely value, growth and index investing. The strategy an investor chooses is affected by a number of factors, such as the investor’s financial situation, investing goals, and risk tolerance. mindset. Successful investors who are worth replicating are those who previously enjoyed continuous success for a period of 20-30 years. Examples of such investors include Warren BuffetWarren Buffett - EBITDAWarren Buffett is well known for disliking EBITDA. Warren Buffett is credited for saying “Does management think the tooth fairy pays for CapEx? 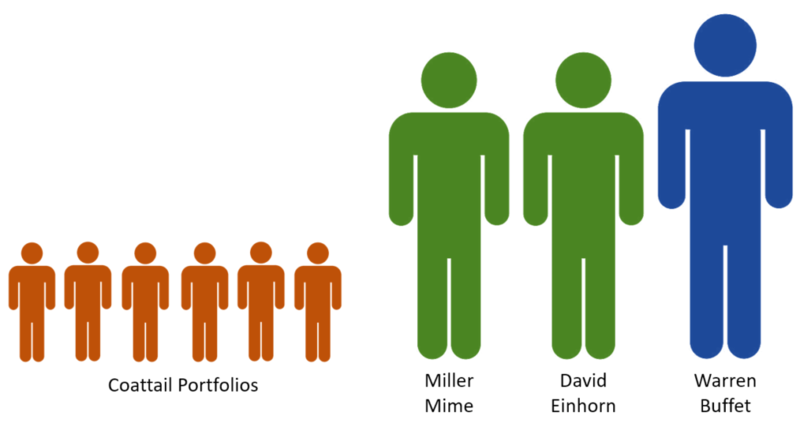 ", Miller Mime, and David Einhorn. How to become a coattail investor? According to a 2012 report by Boston-based research firm Aite Group, copycat investing was one of the top wealth management trends in that year. Institutional investors tend to track several successful investors to see what they are investing in and then replicating that strategy in their portfolios. Large investors who manage more than $100 million are required to file with the SEC what they bought, and what they sold in every quarter. Coattail investors then scour the SEC website regularly for such filings to discover what other large investors are buying and selling in every quarter. Online value investing research companies such as GuruFocus make the process of tracking the portfolios of successful investors. Value research investing companies continuously monitor the best investors and portfolio managers and then provide the information to the interested individual and institutional investors for a fee. The information saves the time that investors could’ve used to track, analyze and sort out the ideal investments that showed a history of success for a long period. Who to copy in coattail investing? Activist investors are those who may cause the stocks of a company to appreciate when their involvement is made public. The media reports every move these investors make and this gives copycats an opportunity to act when the information becomes public. Activist investors also tend to inform their followers via social media and personal blogs on the investment portfolios that work for them. Large money managers with over $100 million in assets under management are required to file SEC form 13F that details investment holdings with the SEC every quarter. This information is accessible on the SEC website, and any members of the public can get this information for free and use it to plan their next investments. Investors with a buy and hold mindset like Warren Buffet provide a good platform for coattail investors to copy their ideas. The advantage of buy and hold investments is that they offer a time lag that investors can use to implement the trade replication and wait until when the original investors are selling off their investments, usually after a period of between 5 to 15 years. Short-term investments are too risky for copycats since the time lag between buy and sell is too short to implement the trade replication and earn a reasonable rate of return. How to succeed as a coattail investor? Some investors are likely to make investments blindly with the hope of achieving a high rate of return because another investor invested in the same investment. Each investor’s level of risk tolerance is unique, and they invest with the expectation that the trade can go both ways, and it can leave the copycat investor at crossroads. Conducting due diligenceDue DiligenceDue diligence is a process of verification, investigation, or audit of a potential deal or investment opportunity to confirm all facts, financial information, and to verify anything else that was brought up during an M&A deal or investment process. Due diligence is completed before a deal closes on potential investments can help disclose any red flags that can make the investment too risky for an ordinary investor. Successful investors are patient, and they can wait for the longest time possible before disposing of their investments in a company. Some investments may take 7 to 10 years to bring in substantial value to the initial investments. Investors must exercise patience when investing in certain investments like buy and hold pools that may take longer to mature. Similarly, investors should exercise patience when investing their money in a portfolio. Sometimes, stocks price may rise due to an artificial event, and this means that there is a likelihood of the stock prices falling in the future. The best time to buy such stocks is when prices are low rather than buying them when the prices are high due to an artificial event that will not last for long. An investor who wants to capitalize on copying investment strategies of successful investors should track the portfolios of several pros in various sectors. What works for one investor may be different from what works for other investors in different sectors. Diversifying copycat strategies can help increase the chances of getting positive returns across several portfolios and reduce the risk of depending on only one guru for investment ideas. Following investors with a credible background and who had enjoyed their fair share of success over the years increases the chances of getting good stocks to replicate. Successful investors like Warren Buffet often share their ideas in conferences, business journals, and popular finance websites, which can help new investors in their investment journey. Occasionally, such investors disclose their portfolios and market outlooks on the best investments to watch out for. What are the risks of coattail investing? Some investments take longer to mature and realize meaningful returns on the initial investments. Investors who are impatient or are looking for easy ways to profit in the short term may end up disposing of their investments too early, and it may result in losses. In a market where there are too many individuals and institutional investors who are watching what the money managers are doing, some investors may delay in getting crucial information that puts them on the losing end. In the stock market, any valuable information becomes obsolete within a few seconds or minutes and it disadvantages slow investors.